Amazon has launched a new lite Android browser called Internet: fast, lite and private. This browser is for all conditions and location when the internet connectivity is not good. The app is lightweight so any budget or entry-level smartphone will be able to run it easily without any random reloads or lags. The Internet browser app is now available on Google Play Store for free and is compatible with all the Android smartphones running the Android 5.0 Lollipop or higher. This one of the few ‘lite’ browser apps for Android smartphone which is only 2MB so anyone with a poor data connection can download it without any problem. Comparing it to some popular smartphone browsers, the Google Chrome browser is 21MB, Microsoft Edge is 54.5 MB, Mozilla Firefox is 19.9 MB and Opera browser is 14.7MB. The Amazon Internet browser is only 2MB which is the smallest browser for Android smartphone from Amazon which takes less space and offers some privacy-oriented features too. The description of the app in Google Play Store shows Private which means that this browser won’t ask or extra permission which other browsers do to collect the user’s information and data. This browser app also blocks website trackers. It also enables the private tab where you can surf the internet without saving any browsing history. The Internet browser also comes with features like tab previews, automatic full-screen mode, integrated newsreader and more. 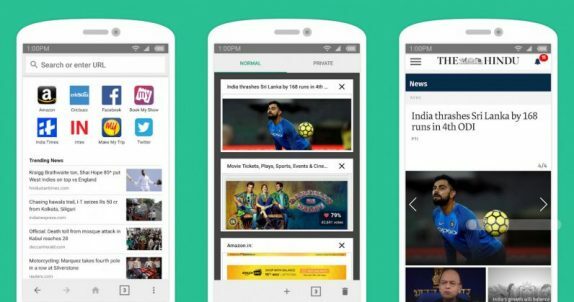 The news reading experience indicates that the browser is built for the Indian users. Amazon also offers the Kindle Lite app in India to read books without taking a lot of storage space on the phone.